Tigrigna is a semitic language spoken by Eritrean population and in the Tigray Region of Ethiopia. Holy Bible in Tigrigna comes  with all 66 books of old and new testament. 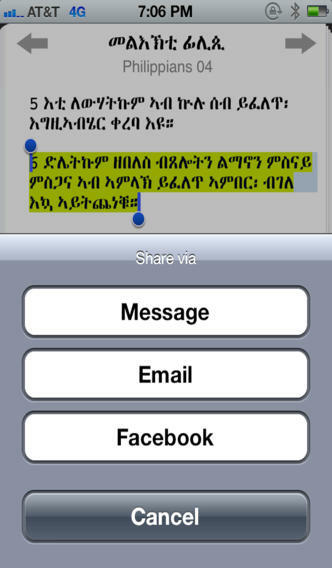 Offered with essential iOS features, utilizing the power of apple device for Tigrigna speaking community. A simple, yet a powerful design allows users to easily read the Bible, navigate, highlight important verses, bookmark and take notes. -Choose from a selection of eight different font style ( GF Zemen, Abyssinica, Jiret, Yebse, Washra Semi Bold, Washra Bold slant, Washira Bold, Wookianos). Take your Bible with you wherever you go.